Due to increasing competition in the workplace, working professionals are now forced to expand their learning horizons via online or distance learning. Many universities are now leaving their rigid regular education methods and introducing new innovative distance/online education courses especially designed for young working professionals. Some distance courses like Distance MBA are now very popular among the masses due to its professional value specially if done from well known universities. Distance education or distance learning is the education of students who may not always be physically present at a school. Traditionally, this usually involved correspondence courses wherein the student corresponded with the school via post. Today it involves online education. Courses that are conducted (51 percent or more) are either hybrid, blended or 100% whole instruction. Massive open online courses (MOOCs), offering large-scale interactive participation and open access through the World Wide Web or other network technologies, are recent developments in distance education. A number of other terms (distributed learning, e-learning, online learning, etc.) are used roughly synonymously with distance education. An MBA program in which the course content can be imparted without your physical presence in a class falls under the category of a distance MBA program. Why would someone choose a distance MBA program? For experienced senior professionals considering an MBA education in another geographical location, the option of a full-time or part-time MBA program may be ruled out considering that at this point, they’d be well-settled with a family and taking a break from work or relocating to a new place for year or two would bring about several disruptions. Executive MBA programs come with a steep price tag. You must also take into account the additional costs involved for travel to attend the sessions. This may not be a viable option for many. Considering that most other options are ruled out, the most practical as well as economical alternative for such folks would be a distance MBA program. What are the other advantages of a distance MBA program? 1. Such a program would save you the opportunity cost that you’d bear if you were unemployed for the one/two years you’d spend doing your full-time MBA. 2. If case of international MBA program, the cost of a distance MBA program would be way lesser compared to a full-time MBA. The tuition fees would be lower; you’d also be saving on the cost of living in an international location and other associated costs. 3. These programs usually have a flexible schedule. It allows you the convenience of completing the course requirements while you continue with your professional commitments. If you need a break due to your work pressure or on account of any personal reason, usually your program should allow you that. For example, at UNC Kenan-Flagler Business School, you may complete the program in as little as 18 or as many as 36 months. 4. Even if you were to change your location or you have travel involved, it’s possible to continue with your program. 5. You can apply the business concepts that you learn at your workplace. Dan Bursch, director of the online MBA at UNC Kenan-Flagler Business School is of the opinion that the number of online MBA program would continue to take a grip and evolve and it won’t be long before you see half of the top 20 business schools having their online MBA programs. 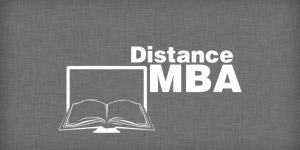 What are the various types of distance MBA programs? Before the onset of online MBA programs, correspondence courses were popular where the printed material would be delivered to you. This would require a lot of dedication on your part as self-study would be involved. In addition to the course material, there may be some audio/video learning aids to assist the learning process. At the end, you’d be evaluated through assignments and exams. This mode of delivery is still in use in India. Technology has revolutionised the delivery methods of distance education. Distance MBA in the form of online MBA and hybrid MBA is gaining popularity with reputed international b schools offering these programs. Hybrid MBA programs differs from an online MBA as it would have some on-campus element (multiple immersion experiences) in addition to the online delivery of content used by online MBA programs. What methods of online delivery do these programs make use of? Usually, the online MBA component comprises of a blend of asynchronous as well as synchronous course work. Synchronous courses are the live sessions where you’ll be able to interact with your professors and peers thus simulating a real classroom. For this, the professors and the student participants need to be online at the same time. Through video conferencing, live class sessions can be held with the professor and multiple students who can participate and engage in discussions. The class sizes are usually kept small to ensure a better learning environment. Such sessions are held at periodic intervals, usually once (or more) a week covering the coursework for that period. The only requirement for taking such sessions is an internet connection and a webcam. Such interactive sessions may also be recorded so that you can watch them at a later date. There may also be one-on-one interactions with your instructor or feedback sessions. Synchronous chat rooms allow multiple users to log in and have a text chat. Asynchronous learning comprises the reading material, videos, presentations, case studies, assignments, tests that you can access as per your convenience and complete at your own pace. Depending on your preferences, there may be students who’d vote for the synchronous sessions considering the active participation and learning derived by sharing thoughts and experiences and the chance to know your classmates better. Some may not be able to attend these live sessions owing to their hectic work schedule. On the other hand, there may be others who’d vouch for the asynchronous courses as you’re able to take it without much pressure and these sessions are more relaxed and offer more time to think, grasp various concepts, and form your opinion or arrive at any answer. Even an online MBA program may have a residency component. These sessions may be held on-campus or elsewhere so that students can mingle with their batch-mates and form long-lasting relationships. So you need to check where these sessions are held. A lot of students look forward to this chance of being able to network with the faculty, staff, classmates, and possibly alumni during these visits. What are the admission requirements of international distance MBA program? International programs may offer multiple intakes (either a fall and spring intake or rolling admissions) for the distance MBA program. The admission requirements is not standardised and would vary depending upon the school. Though there’s a perception that for an online MBA, no GMAT or GRE score is required, this may not apply to all schools. A GMAT/GRE score is required for reputed US b schools for candidates with lesser work experience. However, this requirement may be waived off for professionals with greater work experience. In addition, the rest of the components: MBA essays, letters of recommendation and interviews may also be required as part of the application process. International candidates may also need to take the IELTS or TOEFL. However, there are good distance MBA programs that have a compulsory minimum experience requirement where no GMAT score needs to be submitted.